How did we find ourselves in September so soon? It seems like June was just a heartbeat ago! Did you have a good summer? What were the highlights for you? I’ve never been a good gardener. Oh, I love the idea of gardening. I love to see our vegetable garden tilled until it’s a soft, dark bed of rich Iowa soil. I love buying seed packets and plants, and putting everything in neat rows. The concept enchants me…but the unpredictable results, not so much. Some years we have a good crop of tomatoes but nothing else grows. Some years, the green peppers go crazy but the tomatoes are a failure. This year, swarms of Japanese beetles took out almost everything except some rogue zucchini that lurked stealthily amongst the vines, then seemed to explode into giant baseball bats overnight. And the weeds—oh, my. It was a stellar year for weeds! But those failures aside, at least this year seemed to be the Year of the Flowers, though not due to any effort of my own. In our planters, the impatiens grew into gorgeous mounds of color like never before. 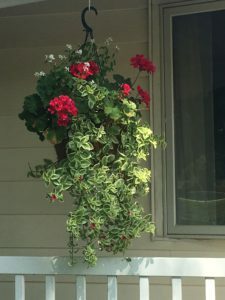 A hanging basket on our semi-shaded front porch–for the first time ever–grew rich and full, and the rose beds went crazy! The unruly, unpredictable behavior of our gardens reminds me of how writing can vary so wildly from one book to the next…some books come easily, but some can be extra hard to write–maybe the characters just refuse to cooperate, maybe the plot takes twists and turns that I didn’t expect. Or maybe there are too many days in a row when life intrudes or when my brain just doesn’t want to cooperate. But whether it’s gardening or challenging life events or a book deadline that’s approaching waaay too fast, I pray for guidance, inspiration and fortitude, then hope for the best! Hi Roxanne. Beautiful flowers. We have roses growing just outside our back living room window and they have budded up nicely waiting for summer. Our fruit trees have blossomed, but it is still way to cold to think about planting vegetables. Thank you, Wemble! And good luck with your vegetable gardens! Doesn’t it seem like it’s always a stellar year for weeds Roxanne? Your flowers are beautiful! Thanks, Jill. And I agree–if nothing else, at least the weeds do fine. LOL! I’m terrible at gardening so I leave that to my husband and children. Your flowers as beautiful! Hi Roxanne! Thanks for sharing. My mom was a fantastic gardener. I didn’t get her gene. Your roses are gorgeous. Maybe if you take a rose with leaves attached, a garden center can tell you what kind you purchased. Or take a close up photo for next spring. Thanks for your analogy. We can pray for guidance and strength, but need faith to see us through the mundane. Life happens and not always the way we want. Thoughts this morning are with all the folks in Florida. Sweet Christmas Kisses 4 is preordered. Enjoyed reading your selections in Sweet Christmas Kisses 1, 2, & 3. So no need to include me in your drawing. Best wishes and Happy Writing. My tomatoes are still producing, but my peppers never had one pepper. Some things did well, but others fair, and peppers and carrots not at all. I’ve been busy canning and will be doing more today. Your roses are beautiful. I’m always impressed when I hear that someone cans. My mom only made jams and jellies, so I never learned how to can fruits and vegetables. I tried applesauce one year, made a huge mess in the kitchen, ended up with five quarts, then never dared serve them for fear I’d done it wrong and might make people sick! At that point I gave away the canning supplies I’d bought, and gave up. :) But I still wish I knew how to do it. Hello, your roses look wonderful. nothing happened here this year, flowers or vegies. I was laid up. oh well there is always next year. my mom on the other hand could always get anything to grow. she was the epitome of the green thumb. So sorry you were laid up. :( I hope you are better, now! I’m always in awe of people like your mom. I think it takes a real gift to be a great gardener! Your roses are beautiful. I cannot wait to read your book. I have already preordered Sweet Christmas Kisses 4. I hope you will enjoy the anthology this year! Thanks for pre-ordering! Sounds like a wonderfully successful year! I’ve never tried watermelon or corn. This year out of around eight tomato plants we got TWO tomatoes. I need some of your talent!! We have pots on the back porch for tomatoes and green peppers. They did very well this year, still coming on. We are in middle Missouri. The potted begonias and daliahs did well too. Last year was the year of the beetles here. We got a few; but less than a mile away our pastor had 4-6 garbage bags full last year. 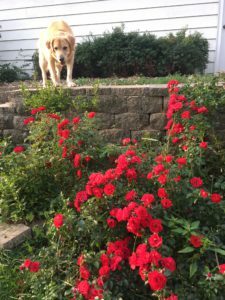 Don’t know what your roses are – maybe climbing or trailing? I’ve been thinking about trying pots on the deck for tomatoes and peppers. Maybe next year! What great idea! Your flowers are beautiful! I’m not very good at gardening, I love the results of it though. Wish I could be more interested in it and have a beautiful garden. I love picking my own zucchini and tomatoes from the garden. However, we haven’t had our own garden for about 5 years now – first couple of years was due to my husband and I taking turns having heart surgery in the summer. Then it was the California drought. Now we need to get our well worked over (our house is on city water, but it’s too pricey for the garden)… At least we have a great farmer’s market each week. So sorry to hear about both of you having heart surgery. I hope you are both doing well, now! Thank you for sharing your pictures. The flowers are gorgeous! I love them but I don’t have a green thumb. Our yard has looked better this year than it ever has due to my husband. His dad passed away April 1 and used to own a flower shop. I think my husband was trying to honor him by putting so much work into planting and growing so many flowers. So sorry to hear about your sad loss, Gail. What a sweet and touching way for your husband to honor him. Thoughts and prayers for both of you. 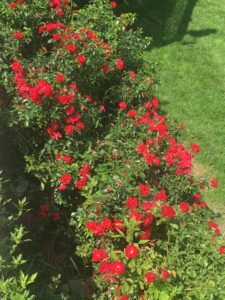 Love the roses – perhaps a Knockout variety? I had my doubts about my roses this year, but apparently my old “Cuthbert Grant” hardy rose just had a late start this year – as it did finally bloom later in the summer. Got to appreciate some flowers on it and my other old fashioned rose before the beetles found them. I haven’t heard of that variety. So sorry to hear that the beetles found you, too! You are a new author to me, so I went to Amazon to check out your books. Then I realized that you have stories in the Sweet Christmas Kisses sets (that I have but have not yet read). We used to have a big garden, but I only have a few flowers now. We had a great but busy summer. We saw all of our 6 (soon to be 7) grandchildren, so we have been blessed! Thanks for checking me out, Becky! 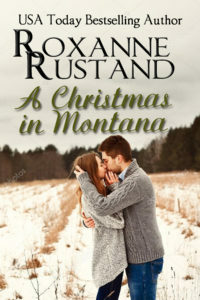 The books prior to 2007 were secular fiction, but from 2007 on they have been inspirational or sweet romance–just thought I’d mention that in case you ever pick one up. I hope you enjoy the Sweet Christmas Kisses anthologies….I sure enjoy writing a novella for each annual edition! Roxanne, love hearing about your garden. I haven’t figured out AZ gardening. It’s really hot, and my attempt at tomatoes in a pot were foiled by some animal that managed to get into our fenced yard. I was left with just a stem, and the weather had already turned, too hot for any success with tomatoes. Love hearing about your garden. I put in 3 tomato plants and have gotten so many off of them so far. Have had to give some away. I don’t can tomatoes anymore, just enjoy the fresh ones and giving away. I also put in a few new flowering plants this year and they have done well. Guess we have had some decent weather here this year in Iowa to have a bumper crop. I love flowers and can never have too many. I am so not a gardner! My husband is much better at it than me, We did have a few tomato and pepper plants this year. Got quite a few tomatoes but not many peppers. Interesting…because it seems like here, a “good tomato year” means few green peppers, and vice versa. But I haven’t been able to figure out why! I love gardening at the beginning of summer. I’m tired of the weeding and watering by the end. Our flowers were late bloomers this year, but they have looked great since mid-August. You’re flowers are beautiful! Ellie, thanks for your comment! I used to grow tomatoes but my garden spot became too shady as a tree kept growing, so I have given it up. I also just got burned out on gardening. Might your roses be knock-out roses? That does sound familiar. Maybe….. once winter hits and all of the leaves fall off, I’m hoping to find a tag amidst all of those thorny plants! If I don’t, I’ll remember Knock Out Roses for next spring! I love your pics. Thanks for sharing. I’m very late to these posts this week! My sis-in-law has been down visiting us and we’ve had a good time with her. I’m definitely NOT a gardener nor do I have a green thumb, lol! I do admire other people’s flower beds/ gardens/ lawns though. My ex-neighbor had beautiful rose bushes in her front yard, she would get so mad when the deer would come and eat the buds off! She must have tried everything to keep them at bay to no avail. Even in spite of that, they grew beautifully! My dad was also a huge green thumb, I remember all the houseplants he had and the terrariums full of what he called Mother-in-law tongue. And the huge spider plants hanging from the ceiling. It was a virtual forest walking through our house, lol!